A Mind to Kill: Mystery and Suspense on Television. 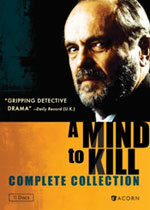 A Mind to Kill is a Welsh crime drama that stars Philip Madoc as Detective Chief Inspector Noel Bain. A widower (whose wife was killed by a drunk driver), Bain lives with his teenage daughter, Hannah (Fion Wilkins). 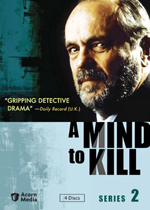 The series ran for 5 seasons on a somewhat irregular schedule, from 1994 through 2002 on S4C, and was filmed in both English and Welsh. A 1991 made-for-television film (Noson yr Heliwr, "Night of the Hunter") served as the pilot. The series is titled Yr Heliwr ("The Hunter") in Welsh.